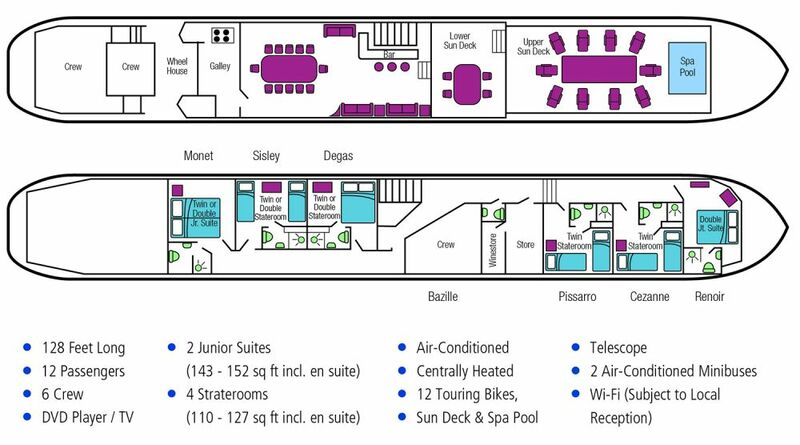 PerryGolf is delighted to add the beautiful 12 passenger hotel barge L’Impressionniste to our golf cruising portfolio. L’Impressionniste began life as a cargo barge in Holland before undergoing a complete transformation into the powerful canal and river cruiser she is today. Her light and airy interior features picture windows and selections of prints, fabrics and wall colourings reminiscent of the turn of the century era after which she has been named. Her Burgundy cruising area is renowned for ... Read More. its vineyards, Gothic churches, Renaissance châteaux and picturesque villages, with gastronomic delights and the art of living having reigned supreme here since Roman times. L’Impressionniste offers six staterooms which can each be configured as either doubles or twins, all are air conditioned and have en-suite facilities. She is crewed by a knowledgeable Captain, Master Chef, Tour Guide and two Housekeepers who will collectively ensure you have a fabulous week both onboard and ashore. Our special itinerary combines sightseeing plus either two or three excellent golf courses, all within easy reach of your barging route, and each giving you the opportunity of experiencing the best of golf in Burgundy. Guests are met in Paris in the early afternoon and transferred to the elegant L’Impressionniste moored in Fleurey sur Ouche for your cruise through Burgundy. A Champagne reception welcomes you on board and provides you with a chance to meet the crew. Overnight: L'Impressionniste at Fleurey sur Ouche. After breakfast, we drive to Château de Chailly golf course which was designed by Thierry Sprecher and Géry Watine, professional champion of France in 1989. Around its 16th century château, the Chailly golf course offers a magnificent setting, marrying the classicism of a formal garden with modern golf course construction. In the afternoon we return to the barge and enjoy a leisurely cruise along the enchanting canal to Sainte Marie sur Ouche. which also promises a walk or cycle along an ever-present towpath cruising past sleepy villages and pretty lock houses. Dinner on board. NON-GOLFERS: This morning, we visit Clos de Vougeot, headquarters of the esteemed Chevaliers du Tastevin, who award a special prized label to the finest Côte d’Or vintages every year. On the way back to the hotel barge we enjoy a wine tasting of fine Burgundy wines at a reputable domaine. After a later lunch on board, we enjoy a leisurely cruise along the enchanting canal to Sainte Marie-sur-Ouche, which also promises a walk or cycle along an ever-present towpath past sleepy villages and pretty lock houses. After breakfast, enjoy a walking tour of old Dijon, including a visit to the vivid produce markets, mustard shops and the impressive Notre-Dame de Dijon, or enjoy some excellent shopping time. Return to the hotel barge for lunch and a leisurely afternoon cruise to La Bussière and perhaps a walk or bicycle ride to the next lock or two. Overnight: L’Impressionniste at La Bussiere. After a short morning cruise, we set off on a drive through the vineyards, stopping en route at the “vigne de l’enfant Jesus”, a famous vineyard owned by the Domaine Bouchard Père et Fils. There, a wine expert will give us a real insight into the domaine’s production of its Grand Cru and Premier Cru wines. We continue to Beaune, capital of Burgundy wine country, for a winery tour and private tasting of Bouchard Père et Fils wines before enjoying a gastronomic lunch in the orangery of Château de Beaune, owned by the winery since 1820. Afterwards, we visit the fascinating 15th century Hôtel-Dieu Hospice and explore the town, before returning to the barge for a short evening cruise to Pont d’Ouche. GOLFERS have the option today, instead of participating in sightseeing activities, of playing nine or eighteen holes at Golf de Beaune Levernois. The course was designed in the middle of the vineyards of Burgundy, within a framework of relaxation and greenery. Overnight: L’Impressionniste at Pont d’Ouche. Depart after breakfast for golf at Chateau D’Avoise. This natural 18-hole course, laid out over an area of 300 acres among clumps of birch woods, towering beeches, ancient oak trees and an artificial lake provides a very interesting challenge, both technical and strategic. Return to the barge and a short leisurely late afternoon cruise to Vandenesse-en-Auxois. NON-GOLFERS: This morning we visit the medieval village, craft shops and castle of Châteauneuf-en-Auxois, once an outpost of the Dukes of Burgundy and offering a fine overview of the feeder lakes, canal and surrounding countryside. After lunch back on board, we cruise to Vandenesse-en-Auxois, passing grazing white Charolais cattle, rolling hills and picturesque villages, crossing the only aqueduct on the Burgundy Canal. Our last day’s leisurely cruise takes us to the canal summit, 1,250 feet above sea level, just before the Pouilly tunnel. This afternoon we visit Château de Bussy-Rabutin and see the portrait gallery created by the disgraced courtier of King Louis XIV, before strolling through the gardens and enjoying views of the château surrounded by its moat. Disembark after breakfast and transfer back to Paris by midday. On alternate weeks the cruise will sail in the reverse direction. This is a Sample Itinerary and is subject to change. Château de Chailly golf course which was designed by Thierry Sprecher and Géry Watine, professional champion of France in 1989. Around its 16th century chateau, the Chailly golf course offers a magnificent course marrying the classicism of a formal garden with modern golf course construction. Golf de Beaune Levernois. The course was designed in the middle of the vineyards of Burgundy, within a framework of relaxation and greenery. Chateau D’Avoise. This natural 18-hole course, laid out over an area of 300 acres among clumps of birch woods, towering beeches, ancient oak trees and an artificial lake provides a very interesting challenge, both technical and strategic. Natural streams meander through three holes on this excellent course designed by the experienced architect team of Thierry Sprecher and Gery Watine, who have more than 50 courses across Europe to their credit. They weaved the demanding layout through the century old trees and wisely used the gentle undulations. Water hazards come into play on several holes as well. There are elevated greens and well-placed bunkers throughout. The 11th hole is the signature hole, a semi-island green with the chateau in the background. The course was designed in the middle of the vineyards of Burgundy, within a framework of relaxation and greenery. This natural 18-hole course, laid out over an area of 300 acres among clumps of birch woods, towering beeches, ancient oak trees and an artificial lake provides a very interesting challenge, both technical and strategic.